Tomorrow is February 29th A great way to use that extra day! If you haven’t been to the Wednesday Santa Rosa Farmers Market, come on down. No matter what you are looking for – the perfect ingredient or an easy no fuss meal- you can find it at the market. It’s a rain or shine market but the rain will have stopped. There are signs of spring everywhere. 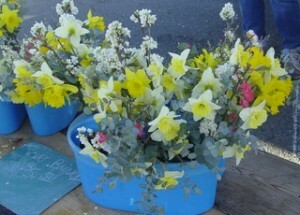 Bunches of daffodils and beautiful bouquets are available from Ortiz, Triple T Ranch and Farm and Ridgeview Farm. Put together a perfect salad. Min Hee Hill Gardens brings their beautiful lettuces to the Wednesday market. The Olive Press is there with a variety of grades and flavored olive oils. Jack also has vinegars as well. Armstrong Valley Farm has potatoes, hardy greens, kohlrabi, garlic and plenty of great ideas on quick and easy recipes for his produce. There is great bread , fruits and vegetables, seafood, heritage pork, chickens, eggs, jams, prepared foods -tamales and raviolis- honey, mushrooms and nuts. If you spend Leap Day discovering the Wednesday market — it will be a gift of time the whole year through. To sell produce at a certified farmers market, all of the farmers’ crops must be inspected. Financial pressures have made the County Department of Agriculture hard pressed to keep up with the demand. Without the certification, the farmer cannot sell the crops at the market. To guarantee all our members can sell everything they are growing, the market is working with the Department of Agriculture to make sure our member farmers are certified in a timely way. 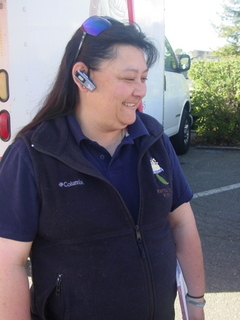 The market has hired Ami Anderson to work with the Department of Agriculture to make sure our members can sell the things they grow not only at our market but at every certified market they wish to attend. Ami Anderson is also a farmer. She and her mother grow a wide variety of flowers and she knows the importance of inspections especially for growers with a wide variety of crops. We have just learned that the Santa Rosa Farmer’s Market has lost its lease for the Veteran’s Hall parking lot and the County has decided to put a not yet formed new farmer’s market in its place. We are in shock. A meeting is being held tomorrow (2/25) inside the Veteran’s Hall after the market at 1:30 and I invite you to attend. We will be explaining what happened and what you can do to help us. Also, a petition will be available to sign at the Information desk at the market. This will be given to the County Supervisors. We also wanted to give you warning about an article that is appearing in tomorrow’s issue (2/25/12) of the Press Democrat containing some extremely misleading information about this development. The transition is not going to be smooth. The majority of vendors are not going with the new market. The present market was blind-sided and in our opinion, was not treated fairly by the County Parks Department. After serving the community in the Veterans Hall location for over 40 years, the market has lost its lease. In late 2011, the Market was told its rent for the Veteran’s Hall was being increased by a 167%. In January, the new Board of Directors formed a Rent Committee to figure out what our members wanted to do and how to make that happen. In the meantime, the County Parks Director, Caryl Hart, awarded the rental contract to another group who wishes to start a new farmers market at the Veterans Hall. The County Parks Department did not give us written notice for signing a renewal, nor any deadline for responding. Had we known we had to provide an answer over four months in advance from the expiration date, we would certainly have done so. Without your help, and maybe without some divine intervention, this market will need to relocate as of June 30, 2012 – four months from now. http://supervisors.sonoma-county.org/districtlookup.aspx?sid=1001 and look it up by ZIP code. Leave a message for each of them, if you like. 2. Come to the Supervisor’s Meeting on Tuesday, February 28th at 2:00 p.m., and ask the supervisors to rescind this decision. The address is 575 Administration Drive, Santa Rosa, CA 95403. Show your support for the market and let them know that we like things the way they are. Let’s pack the place! 3. Email and/or call ALL of your friends who might care to do #1 or #2 above. Forward this email to them. 4. Give us your ideas – email me at hotpeppers@pon.net or call 522-8629. Stuck in a vegetable rut? This is the place to shop. Other vendors currie favor by presenting the same old fruits and vegetables, but Orchard Farms challenges the cook to love all produce – the ugly ducklings as well as the beautiful. There are baskets of crisp, juicy lettuces and piles of beautiful braising greens, alongside purple kohlrabi looking like something from outer space. Have you ever heard of salsify? It’s hard to imagine this dark root is sought after by many restaurant chefs, but one taste of puree will make you a believer. Tired of potatoes? Try parsnips. Want to add color? It’s a piece of cake with a bunch of rainbow chard, but there is also purple sprouting broccoli, bright green Romanesco and scarlet cauliflower. Many of these items have short seasons and farmer Ken Orchard is quick to tell customers to take advantage of the best while it’s available. 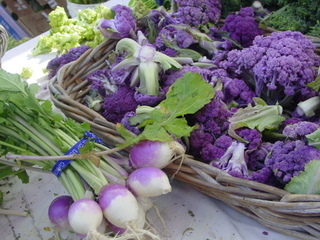 Purple broccoli is only available about six weeks a year but has the most intense broccoli flavor and virtually no waste. And if you’re looking for a real vegetable challenge, subscribe to Orchard Farms’ CSA box and cook whatever comes to your door. Your vegetable saavy will soar! Orchard Farms is at The Santa Rosa Original Certified Farmers Market 8:30 a.m. to 1:00 p.m. Saturday year round. This spring, Monsanto’s GMO sweet corn — their first product for direct human consumption — will be getting planted for the first time. Then it will be sold, unlabeled*, in a grocery store near you. *If they are so proud of their product why don’t they label it? As many people already heard, Sonoma County, our landlord, has raised our rent substantially. We now pay an annual rent of $20,000. Beginning July 1, 2012, the rent will be $57,000. We are in a quandary about what to do and we would like to involve our customers in our decision making process. We will have a special meeting of the market on Saturday, February 25th right after the market – beginning at 2 pm, give or take a few minutes. We want to brainstorm our options. The public is invited to attend. If you cannot attend but have some ideas – we have a lot of ways to get in touch with us. Please go by the information booth at the market and talk to Amy or me. Or you can email us santarosafarmersmarket@gmail.com. Post comments on our Facebook page or tweet us or leave a comment here or call 522-8269. We will keep you updated about developments as we figure out how to resolve this major problem.